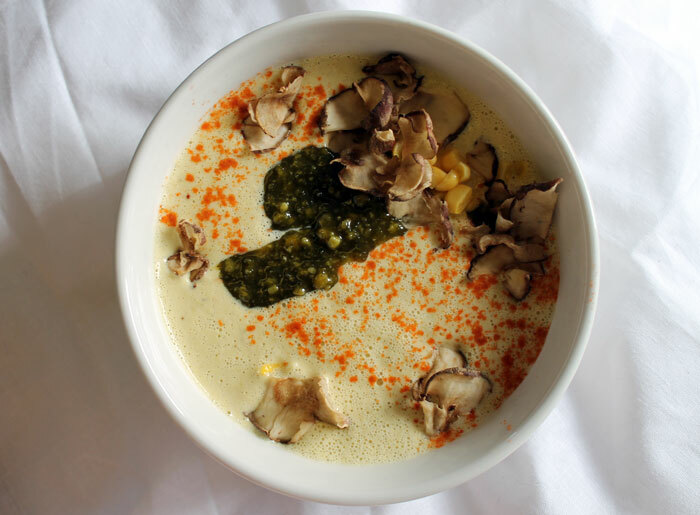 Raw corn chowder soup with raw vegan pesto, cayenne pepper, and dehydrated jerusalem artichoke slices. Weight: 55kg. Even though I am now at my ideal weight, my face still looks puffier than ideal and my chin looks fat. I guess this will gradually improve as I continue on raw foods. 9.30pm: Woke up. Slept very well. My mouth is very coated - detox ongoing. I feel normal this morning, not better or worse than usual. But I do feel healthy and happy, not tired. 10am: Breakfast smoothie: 1 tbsp spirulina, lemon, water. Banana as a snack a little later. 12.30pm: Did some weight training and yoga. My menses started! So far no pain at all, and also no other 'warning signs' that I usually get. 12.50pm: Avocado with salt and olive oil - tasted so good. These are the same Tesco avocados that tasted metallic earlier on during this diet. Did the 'spine twist' stretch exercise. It always makes my body go into the 'trauma release exercise' shake mode. This time I felt pain deep inside my upper back - between the spine and the shoulder blade on the right hand side - felt like muscle tension, concentrated in a very small area. It didn't get released although I stayed in the stretch for a while. I haven't noticed this before. Using my oven at 50 degrees Celsius (122 degrees Fahrenheit) to dehydrate thin slices of Jerusalem artichoke. I propped the door open slightly to reduce the temperature so that these will count as raw. 3pm: Feeling a bit tired because of the exercise earlier. Had tomato soup (cherry tomatoes, a lot of olive oil, salt, dried oregano). 3.45pm: I have to take a nap. I wonder if I feel tired because of too much fat in the soup. 5.30pm: I ate a banana, took supplements: Niacin 500mg, iron, B12 (1,000mcg). Testing whether taking these in the evening affects my sleep. 6pm: I wonder if the exercise with heavy weights was a bit too much for me, or if I didn't eat enough protein. I should probably get into a habit of pre-exercise and post-exercise protein snack/meal. I'm feeling a little bit tired now and especially my arms feel a bit weak. My menses have started but not really properly, since there is almost no flow. Still no sign of pain whatsoever. My sense of smell is going strange. Cooked salmon today smells like cooked beans that have gone off. Snacking on sprouts and almonds (not sure if the almonds are raw or not). Went to bed at 11.30pm but couldn't sleep until about 1am. Had some heart palpitations because of money worries-related anxiety. Perhaps the fact that I took B12 and iron late at night made me unable to sleep, and then anxiety followed. I eventually fell asleep with the help of valerian tincture and angelica drops, and after cooling the room by opening the windows. So my anxiety problems have not yet completely gone on this raw food challenge but I did feel that it was easier than usual to calm myself down. The anxiety feelings tend to escalate easier when I am very tired/ have been eating sugar or drinking alcohol/ have eaten many processed carbs. Something woke me up at 7.30am so I decided to get up as I wasn't feeling too tired. Yesterday seems to have been just a little bit of menstrual flow in the morning. There has been no pain and no flow today. 2.10pm: Feeling slightly sick, as if the soup is not digesting too well. Feel like there is a 'lump' or something stuck in my throat too. Slightly tired but fine otherwise. Maybe it's the dehydrated jerusalem artichokes. I keep getting feelings in my belly as if the menses is only starting, not pain, just slight feelings. 5pm: Just woke up. Been sleeping for probably at least two hours. Fell into a very deep sleep, similar to what happens to me sometimes after acupuncture or after a deep-tissue massage. So either this is normal detox (quite possible) or it's because I had too much sugar and fat today. I also felt very light-headed when getting up (low blood pressure). I don't usually get that at all. 8.20pm: Avocado with oil and salt, apple slices, alfafa sprouts. I keep snacking on licorice pieces as well. 8pm: Spirulina and lemon smoothie. 10pm: Had a few almonds, dried aronia berries and coconut flakes. Feeling very well and awake. Went to bed at midnight. No problem falling asleep despite having slept during the day. 10.45am: Breakfast smoothie: berries, lettuce, hulled hemp seeds, hemp leaf, chia seeds, turmeric, milk thistle seeds, water. Feel good today - normal. Not better or worse than usual. I felt a bit sick after the smoothie and supplements. Maybe I drank too much too quickly. 1.40pm: Drinking hot schizandra berry tea. So far I haven't had any hot drinks during this raw food challenge, this is the first one. The heat balance of the body might be upset (I've been feeling very warm the last few days when I didn't eat or drink anything hot). Maybe the body gets confused about the hot water and the cold air being taken in at the same time. If one were drinking live spring water, boiling it would reduce the quality. The digestion might need a break and not constant tea-guzzling. One's mouth might feel clearer when hot drinks are not going in. On another note, I seem to be able to take stress a bit better today. I still get stressed out but my face doesn't go red and I don't feel exhausted afterwards. 6pm: Had a green salad with pea chutney and tomato. Green peas are a good source of protein. 10pm: Yoga, spine twist, the Five Tibetan Rites and muscle exercises. 11.20pm: Another, salad as above, just smaller. Feeling very well and normal today. My nose is a bit sniffly but no red face, no anxiety, no heart palpitations, don't get cold easily, still more flexible, no cough after eating, no achy arms and legs, no fatigue, no low energy, or any other problems. Went to bed at 1am.